One week before the second round of voting in Brazil, Jair Bolsonaro, the extreme right-wing candidate from the Social Liberal Party (PSL), against Fernando Haddad from the Worker’s Party (PT), Lula’s Party, for Brazil’s Presidential run-off elections – Bolsonaro leads to polls by double digits, about 58 against 42. And the gap is growing, despite the fact that as recent as end of September 2018, Brazilian women campaigned massively against Bolsonaro with the hashtag #EleNao (Not Him). His misogynist record left him with only 27% of women supporters only a couple of weeks ago. Massive cheat-and lie-propaganda increased that ratio by now to 42%. – Does anybody seriously believe that Bolsonaro has changed his racist character and his women-degrading attitude? – It is mind-boggling how people fall for propaganda lies and manipulations. We can only hope that the discovery of this slander and fraud may not be too late to stop Bolsonaro’s end run – and to inform voters. Leading to an indictment of Bolsonaro is hardly a realistic chance, as he is supported by the current corrupt and fascist-type Temer Government and all the high judges who have impeded Lula’s legitimate request for running for Presidency. Only voters’ consciousness may make a difference. Imagine what happens, if Bolsonaro is elected? – It is hardly fathomable. Bolsonaro has already declared that if elected he will render full power to the military. “When I’m elected, those who will command are the (military) captains”. His word – in Portuguese. Another brutal military government came to power in 1964 by a coup d’état by the Armed Forces. It ruled Brazil from 1 April 1964 to 15 March 1985 by President Joao Goulart. It came to an end when José Sarney took office on 15 March 1985. What’s important to know is that both the Vargas coup of 1930, as well as the 1964 military coup were supported by the US Embassy in Brazil and the State Department in Washington. Mr. Bolsonaro has already today – after the first election round – the full support of Washington. He was immediately congratulated by the Trump government after the October 7 election result were known. If no miracle happens within the coming week, Brazil may be slanted to go back some 90 years, into a fierce military dictatorship. Worse, today with the neoliberal doctrine being the overarching last word on economic policies, also for the military. We are looking at full privatization of everything, of social services, water and health privatization has already begun; basic and profitable infrastructure, natural resources – and the IMF, World Bank, FED-Wall Street indebtment is already well under way and its future programmed, including a devastating austerity program which under unelected Mr. Corrupt Temer has already started. Just imagine the political and economic impact this would have on the Latin American region. Brazil is by far the largest economy of Latin America with a GDP of about 2.1 trillion US-dollars in 2017, a population of 210 million and a landmass 8.516 million km2 – and with the world’s largest known fresh water reserves. Trade without Brazil is unthinkable for Latin America and the world. Plus, a Bolsonaro regime would have full ideological and military support from Washington. In fact – Brazil may soon become the second South American NATO country after Colombia. How would Venezuela feel, surrounded by two fierce militarized NATO countries? – Washington could just smile and watch, while Colombia and Brazil – and their NATO command – would do the rest. Or would they? – Venezuela is on the best way to detach herself from the dollar hegemony and ally with the East. And that not only in trade, but also in huge investments from China and Russia. Invading Venezuela would not be easy, despite NATO from the east and from the west and with the empire just across the Caribbean. They will realize that this entire propaganda farce serves only a few Brazilian oligarchs, but mostly the transnational corporations and banks. – Will they take to the streets? Demand another government, fight for their rights? Brazilians are not (yet) the kind to double up and shut up, as the Greeks had to do, weakened by a Government of treason, by an absence of medical and other social services and by a low-low moral that is reflected in an exponentially rising suicide rate, according to the British Lancet. Brazilians may have learned a lesson. Brazil and the BRICS. Already under Temer, Brazil’s role in the BRICS was merely anecdotal. It was clear that politically Brazil would and could no longer adhere to the principles that was behind the BRICS association, namely economic independence from the debt masters IMF, World Bank and FED. – What with Bolsonaro? – It would behoove the BRICS expulsing Brazil; sending Brazilians a warning now, before the run-off elections, that no fascist government could be admitted within the ranks of the BRICS. Fascism is the absolute antidote to the new alliances of SCO, BRICS, EEU, and newly the Caspian Sea Alliance (Azerbaijan, Iran, Kazakhstan, Russia and Turkmenistan). But – and this is highly important – let’s not let it get out of hand. 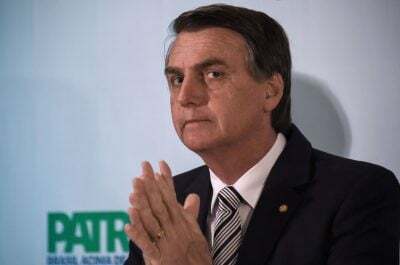 Let not Bolsonaro being elected this coming Sunday. Make the right choice now. Regardless what you are being manipulated to believe. Stand up Brazilians, Women and men – say #NAO Bolsonaro! He is a Research Associate of the Centre for Research on Globalization.